 Day 1: November 1, 2019 - Depart the USA: Depart the U.S. for Marseilles, France. Day 2: November 2, 2019 – MARSEILLES - TARASCON (D): Welcome to France. Meet & greet by a Jet Vacations host in Marseilles airport and transfer to your ship in Tarascon. After you've comfortably settled in your cabin, we'll introduce our crew during our welcome cocktail party, followed by dinner. We moor for the night in Tarascon. Day 3: November 3, 2019 - AVIGNON (FB,L,D): We'll cruise towards Avignon. On the way, enjoy picturesque views of the Provençal countryside as you arrive at your first stop: Les Baux de Provence – a fortified medieval village perched in Alpilles mountain range. Meander through the narrow stone streets of the historic center, viewing the town's many original 16th-century houses and main attractions such as the Museum of Santons, the Hôtel des Porcelets and St Vincent Church. Free time. Return to the boat for lunch and cruise to Avignon. Day 4: November 4, 2019 - AVIGNON (FB,L,D): This morning after breakfast onboard, set out for a walking guided tour of Avignon and the Papal Palace. You will set out on foot for the guided tour of the old town of Avignon. Avignon offers an impressive array of monuments. With the Pope's Palace, classed as a world heritage site by UNESCO and a testimony to the city's past when it was known as the capital of Christianity back in the Middle-Ages, our visit will take you through the staterooms where numerous ceremonies and feasts took place, the chapels, the Pope's private apartments and the terraces which offer a wonderful panorama on Avignon and the Rhône river. Return on board on foot. Lunch onboard. In the afternoon, take an excursion to Uzès and Pont du Gard, the impressive ancient Roman aqueduct. Day 5: November 5, 2019 – VIVIER - TOURNON (FB,L,D): Enjoy a walking tour of Viviers and visit the imposing Cathedral of Viviers. The third largest protected sector in the Rhône Alpes regions, residence of bishops since the Vth century, Viviers, a small town with a population of 3,500 is like an open-air museum, where every stone contains a page of history. You will be able to admire France's smallest Cathedral in this sumptuous medieval town. Among other things you will see the House of Knights with its superb Renaissance facade, the Tower of St Michael, the great seminary and the Belvedere with an unobstructed view of Viviers at night. Return to the boat on foot for lunch onboard. Then, afternoon cruising to Tournon to spend the evening enjoying vistas of its castle. 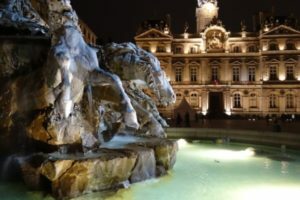 DAY 6: November 6, 2019 - VIENNE – LYON (FB,L,D): We'll cruise towards Vienne this morning. Meet up with the guides for a walking tour of Vienne, during which you will discover this Roman city rich in vestiges. The history of Vienne goes back more than 2000 years. The city is indivisible from the Rhône River and the surrounding hills. The Allobrogi people are thought to have made it their capital, but it was in the Roman era that the city began to prosper on both banks. You will see the Antique Theatre; built roughly between 40 and 50 AD, it is considered one of the largest in the Roman empire, with its 130m diameter and 13,000 spectators capacity. Restored in 1938, it was returned to its original function and is now a venue for artistic events. The tour will continue with the Temple of Augustus and Livia (exteriors only). This temple dedicated to Rome and Augustus stood in a sacred area on the forum and has carried this name since the end of the 18th century. Its construction began about 20-10 BC; it was later transformed at the beginning of the Middle Ages into a church, and was finally restored in the second half of the 19th century thanks to the intervention of Prosper Mérimée. Finally, to complete the tour, you will see the Cathedral of St Maurice (exteriors only), which has been listed as a historic monument since 1840. Return to the boat on foot. 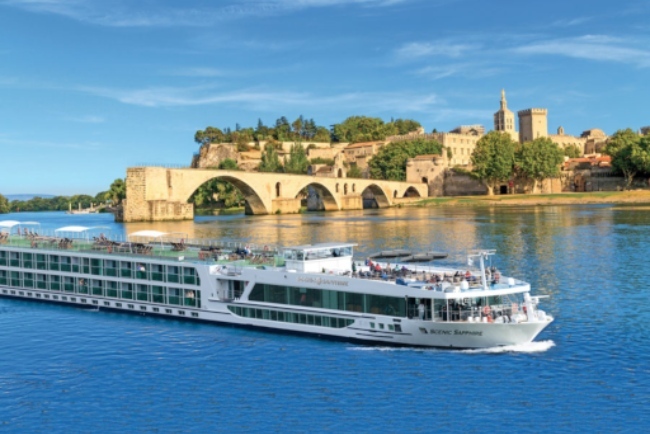 Lunch onboard and relax while you view the beautiful Rhône river vistas as you cruise to Lyon. Day 7: November 7, 2019 – LYON (FB, L, D). Awake in beautiful Lyon, the gastronomic heart of France. This winkling city will reveal itself to you during a guided walking visit by coach and on foot. Our excursion will start with a stop at the Fourvière Basilica. You'll first take in the breathtaking views from the heights of the Basilica before entering it. In 1168, a chapel was built in Fourvière by Olivier de Chavannes, the Saint Jean canon, over the ruins of the old roman forum. The small chapel that was first dedicated to Saint Thomas and then to the Virgin Mary has been destroyed and rebuilt many times. Its current known form dates back to 1740 and its most recent renovation was in 2008. After our visit we'll return to the coach and move on to Lyon's Old Town. You will take a walking tour with our guide and discover the "traboules”, types of passageways that are typical of the city. The first traboules are thought to have been built in the 4th century. There was a water shortage in Lugdunum (the Gallo-Roman name that was given to Lyon at the time) that led its inhabitants to settle in the "lower city” on the banks of the Saône, at the foot of the hills of Fourvière. The traboules were thus used to reach the river quickly. You'll enjoy some free time in the Saint Jean district, in the heart of the Old Town. We'll return on board in time for lunch, and depart at nightfall to admire the city lights in Lyon. 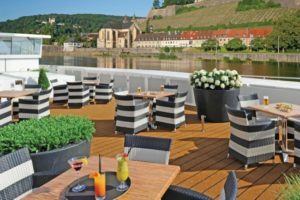 Enjoy one last buffet breakfast on board before disembarking at 9:00 a.m. Coach transfer back to Lyon airport for your flight home or onto your post extension to Burgundy / Champagne / Paris. End of our services.has carried this name since the end of the 18th century. Its construction began about 20-10 BC; it was later transformed at the beginning of the Middle Ages into a church, and was finally restored in the second half of the 19th century thanks to the intervention of Prosper Mérimée. Finally, to complete the tour, you will see the Cathedral of St Maurice (exteriors only), which has been listed as a historic monument since 1840. Return to the boat on foot. 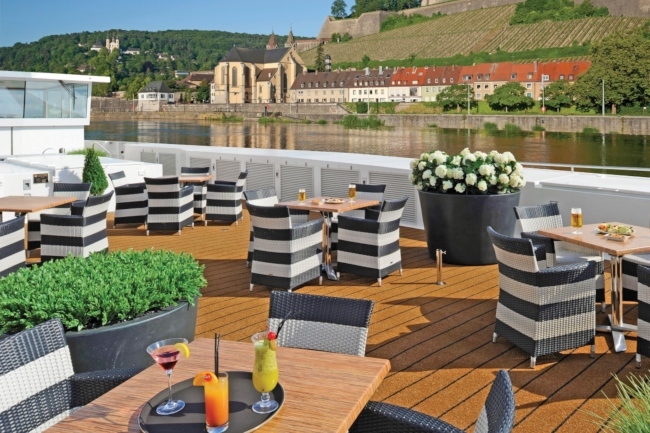 Lunch onboard and relax while you view the beautiful Rhône river vistas as you cruise to Lyon.